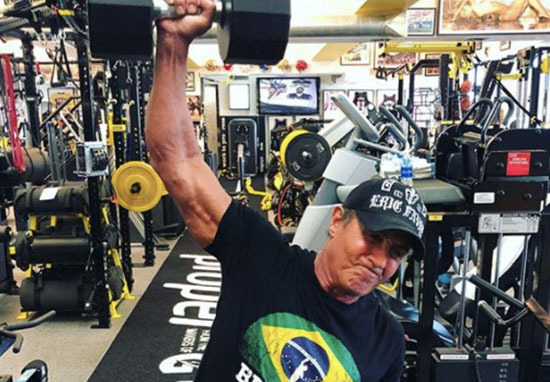 Sylvester Stallone has taken to Instagram to prove that despite his age, his workout regime is as tough as ever. The veteran actor may be 71 but he’s still crushing it at the gym as his recent Instagram video shows. Yesterday Stallone posted footage that shows him doing pull ups with a 100-pound weight at his private gym. Another easy workout! You’re only as old as you and your joints feel! LOL! Receiving nearly 1.5 million views at time of writing (March 14), we clearly weren’t the only ones dazzled by his strength. Especially since the comments section was filled with fans praising Stallone as ‘an inspiration’ and ‘a legend’. Stallone has had an interesting year so far after he was targeted by a strange hoax which claimed he had passed away. The rumour stated Sly had died following a battle with prostate cancer, which bizarrely surfaced about 18 months ago when Facebook users started sharing the fraudulent story. The fake article claimed the veteran actor had been found dead at his LA home but the whole thing was a prank, and linked out to a website known for creating false information on celebrity deaths. Having been the subject of this strange hoax for over a year now, Stallone started to see the funny side of the ‘joke’ in February. Poking fun at his so-called ‘death’, the Expendables actor posted a light-hearted video on Instagram, showing him locking his daughters Sistine and Sophie out of the house. The day before, Stallone shared a photo collage of social media posts about his ‘death’ to his Instagram. The film will be a sequel to the 2015 boxing drama hit, a spin-off from the classic Rocky film series. Maybe the sequel will see him walk away with more gongs. Which we’re sure he could easily lift while doing pull ups.